Amber Kirk-Ford: "It's a Smart Book, Considering It's YA"
"It's a Smart Book, Considering It's YA"
The other day I was on YouTube listening to someone in their twenties talk about a few of their favourite books. I wasn't fully paying attention - the video was open in another tab and I was just listening - but suddenly my ears pricked up. "Even though it's a Young Adult book, it's such a smart read." One of my pet hates is when someone outside of the Young Adult demographic makes the genre seem inferior, sometimes without even realising they're doing it. There's the idea that YA books are less smart than those aimed at adults; that they don't tackle difficult topics, that they're all 'easy reads', that they're simply not as good as adult books because they're aimed at younger people who therefore must be less intelligent. Who remembers that Slate article? It said: "Adults should feel embarrassed about reading literature written for children." Why should they? Since when has it been okay to belittle people for reading? When a teenager is reading books considered to be aimed at adults, everyone's fine with it. They're praised for being so mature. But when an adult reads a book for teenagers, it tends to be the opposite and I'm not sure why. Here's what I think: you can read what you want to read. Books are for everyone. So what if you're a thirty-year-old who enjoys books about broken families, like in Salvage, or exciting teenage road trips, like in From What I Remember? Don't feel ashamed for reading something that wasn't originally marketed at you because, at the end of the day, you're the one reading an awesome book and having a good time. The person sat across from you on the tube who looked at the book in your hands and tried not to laugh? They're missing out on a vibrant world full of diversity and adventure. I know which person I'd rather be. On a completely different topic, I've got a couple of things to tell you. The first is that I recently wrote a piece for the Guardian about mental health issues in YA, and you can read it here. It's had over 1,000 shares and I'm really happy with the response it's had so far, especially as it's so personal. I'd love for you to check it out and let me know what you think, either here in the comments or on Twitter! Secondly, I'm lucky enough to have been shortlisted in the Blogger's Blogger category in the UKYA Blogger Awards and, if you feel like I deserve it, I'd love for you to vote for me. Obviously you don't have to if you don't want to - just make sure you read my Guardian article instead. ;) Thanks for reading this little update-ish bit! I'm with you. I've never really restricted myself to any genre; a good story is always a good story. One of the things that surprises me most though, is that, a lot of YA books deal with more potent themes. At least, that's my experience. 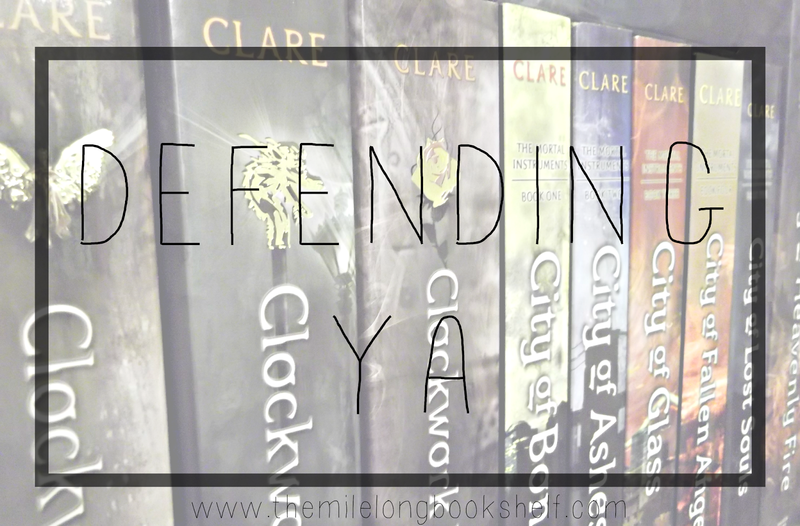 I've read some great YA books about self-identity, choice, fear etc. All topics I think the majority of us can actually relate to. On the other side, I've read many an adult book with themes that I may never really come into contact with. I think any genre of book comes with fast, light reads and some that are deep and have you contemplating life. It's all about our own personal preference, and someone's preference should never be mocked. Yes. People should read what they want to read. Reading tastes change as we age, too. Those people who slam others for what they read might end up wanting to read some of the things they are frowing upon now. Plus, if and when people have children, you may get turned back onto some new books in a series you read as a child/tween/teen, or to new books in the genre. I ended up reading all of the related books in the Wrinkle in Time series after re-reading the first three with my son. I also started reading YA after my son brought The Giver home from school. That is certainly one of my biggest pet peeves. The worst part is when I see my family doing it. I love my siblings, and we tend to agree on social issues, but not always. I've heard my sister say "teen, paranormal, dystopian romance" with the most disdainful tone, as if those genres automatically mean a book is bad. To me, it's no different than putting boys down for liking pink just because it's a "girl's" color. It doesn't mean pink isn't a great color or that boys aren't aloud to like it (alright I think I've taken this metaphor far enough). Great post, and I'll be sure to vote for you! I'd be interested in knowing what this person means by "a smart book." If they were expressing surprise that a YA book can be well-written, then I think they really haven't been paying attention to the YA market. There are lots of well-written teen novels. However, there is just a little something to the idea that YA novels are "dumbed down." My greatest frustration has been with teen science fiction. There is definitely a tendency in many, if not all, YA science fiction books to keep the science aspect low-key. Or, perhaps, at a high school level. That's great for the intended audience, but, as someone with the background to understand more complicated explanations, I find it frustrating. So, I guess I would say there are possible arguments to be made that YA books, as books intended for 12-18 year olds, may sometimes shy away from complicated concepts, big vocabulary words, etc. I'm sure there are stories of authors who have been asked by their editors to make things simpler. However, that doesn't mean I don't love and enjoy YA and think there are lots of fantastic YA options. In answer to your main post I say ANYONE can read ANY BOOK THEY LIKE regardless of age. As you know I really enjoy reading Teen and YA books and i am 53 and proud. That Slate article really annoyed me and i feel sorry for the writer of it. I have read your Guardian article and its very good Amber. I was so shocked to realise that so many young people go through it. I began getting anxiety attacks in my early 40's and thought that was young enough really. Great rule to live by! What a fabulous article! Congrats! I honestly don't understand why people try to underrate YA. Honestly, I think YA is super important for everyone, because it provides answers to many issues that kids are dealing with today, and parents can look to these book as well to gain an understanding of what their children might be struggling with. Personally, I don't even think about genres. An outstanding book is an outstanding book, regardless of whether or not it's YA, adult, fantasy, etc. Who's the book is aimed at isn't even a factor. Thank you! So true. Genres are great when you're reviewing a book because it provides a sort of 'guide' but, outside of reviewing, genres shouldn't really matter as much as they do. Don't why people rect like that when a adut reads MG OR YA , it the choice and they like it, so whats the fuss. I hate this too. I'll be 30 in a few months and the majority of what I read is YA. I think no matter what age you are you can find something interesting and enjoyable in a book regardless of what age group it is marketed towards. I personally even hate the idea of calling YA a genre. It's not a genre, it's a marketing category! But there is a general misconception that all YA is one specific thing and it is judged based on the most popular books. Every time someone says something demeaning like that about YA I always think I can change their mind about it, if I can only find a book that they will love, but that's not the point. I recently read this great article by the AV Club which says that we are talking about YA all wrong. We tend to divide the "genre" into two different divisions. The popular and fluffy kind of books and the serious and well-written kind of books. I think that this exacerbates an issue with literature in general where we give more accolates to certain types of books over others and establish a sort of hierarchy. I read a lot of genre fiction like Fantasy, Science Fiction, and Historical Fiction. I get told all the time that the books I read aren't as good because I'm reading about "imaginary things." We shouldn't demean what a person reads regardless of what it is or who it is marketed towards. We should celebrate reading in all forms! Okay, rant over. Great discussion post! I completely agree. I hate how people criticize YA. I was at my gran for Christmas and she had a friend over and I said that I was going to go read and she said "What are you reading?" and I said Anna and the French Kiss and showed it to her and she completely pulled up her nose. I'm pretty sure if I'd said I was reading Pride & Prejudice or a Charles Dickens novel the reaction would've been immensely different. One of my friends pulls up her nose at YA books despite being my age and she reads only classics, which is totally fine, but I think it's silly that she only reads it because she doesn't want to be like any other typical teenager reading YA. YA books are amazing and they teach us so much and people need to get over the thought that YA books aren't fantastic, because they are. It drives me up the WALL when people disregard YA. It's such a fantastic demographic that I'd wager the themes have a much bigger impact BECAUSE of the age bracket. It's not just lessons for young adults, they're lessons any of us could take something from. So on point, though we've come to accept it so much that as a culture, we don't even notice sometimes when this association is made. One of the things that REALLY bugs me is when a book narrated by a teen/young adult protagonist is marketed as adult fiction. Like, what? Really, people? Person #1: "So, Ashley, I hear you like to read?" Me: "Yes I LOVE to read! I read like 100 books a year." Mom: "She reads Young Adult though...."
"She reads Young Adult though. I know you wouldn't be interested in that." "She's odd because she reads books for young people." "You're an adult and Ashley reads YA, so you wouldn't be interested." You know what I mean? She always feels like she has to jump in and kind of say, "Yes she reads, but it's nothing you'd be interested in because Ashley has 'young' tastes." Hi Amber! I was inspired by your post and the things I have seen online to join you in defending YA against such discrimination! Perhaps you would like to do a guest post on the topic on my blog? I always feel a bit cheeky buying YA books (I'm 21). There is definitely a stigma attached to the genre - they're often viewed as dumbed down adult books, which for me couldn't be further from the truth. I find a lot of YA books are intelligent - their whole purpose is to entertain and help young adults to navigate their difficult teenage years. That's certainly more important than some adult chick lit, in my opinion. I believe that the fundamental difference between YA books and books that are aimed at adults is the scenarios, which are usually more likely to affect teenagers than they are adults. That doesn't mean to say that they are in any way intellectually different. That doesn't mean to say that adults can't read books that are labelled as YA and vice versa. I also found your piece for the Guardian regarding mental health to be quite inspiring; I have struggled with anxiety (including emetophobia) within my life and I think that it is great that you spoke out about it. Yes! When I tell people I want to write Young Adult they look at me like I'm clinically insane. They assume when I "grow up" I will change my mind and write "grown up" books. I do not believe that, based on genre, you can determine which books are intelligent and which books aren't. So say someone believes all fiction/romance books to be more intelligent than young adult. Then you casually point out Fifty Shades of Grey and look at that, you have proven them wrong. This really annoys me, a person shouldn't be judged on what they read whether it is a children's book, YA, Crime, Sci-Fi, Fantasy ect. I'm 29, and my favourite books are still the Harry Potter series, I can read them over and over and do not see a problem with this. Now, i'm off to have a cup of tea and curl up with a good book. I think there are a lot of people who have never read YA and don't know just how "smart" of reads they can be. There are some adult books that are just so formulaic and unoriginal, whereas there are so many YA books I've read that really are so different and make me say "ahhhh!" I hate when people say those things. Great post!